Dr. Zahid of Maldives Meteorological Services (standing 4th from left) and Dr. Yahiya (far right) with some of the FECT staff at the project review meeting. Climate change projections robustly project wetter conditions for most of South Asia. However, in recent decades, an increasing tendency to drought has been observed in Sri Lanka and the Maldives, as well as in East Africa. The credibility of these climate projections is thus in question. To address this question, the regional climate mechanisms, their decadal change, and the drivers of decadal change such as sea surface temperatures must be characterized and their representation in global climate models must be evaluated. Sri Lanka is a good locale for such work because it is data-rich and spatially heterogeneous. The scientific goals of the research project led by the research team in Sri Lanka and the Maldives are: (1) to better characterize drought historically and develop a skillful operational drought monitoring system; (2) to provide assessment of climate change over Sri Lanka and Maldives with characterization of uncertainty and its impacts on future droughts; and (3) to generate assessments—including confidence levels—of water scarcity and drought risk. The overall goal of this multilateral research project is to develop operational tools for drought monitoring and to provide the best assessment of climate change. The development-related objectives of the project are to undertake detailed water scarcity assessments in two locales in the Mahaweli river basin in Sri Lanka and in two islands of the Maldives; disseminate the results (via websites, advisories, policy briefs, and scientific publications); and build capacity and support tertiary education. In terms of the anticipated outcomes, the project team has been providing tools for online access to climate information and a weekly/monthly climate advisory. These tools and advisory will incorporate drought assessments and will be reviewed by water managers and other resource and disaster managers. An assessment of regional climate change and water scarcity projections will be provided to selected policy makers. Demonstrations of the use of these assessments will be conducted in selected locales, which will help build capacity for water resources, climate science, and climate services. The research project builds on USAID's goal to better manage the Mahaweli River Basin in Sri Lanka and will contribute to the ongoing USAID goal to better manage water under climate change in the Maldives. In the spring central Sri Lanka and Colombo witnessed a major disaster event due to intense rains and high winds which resulted in landslides and floods. The team stepped in to provide information support, assisting community responses with scientific information and collecting information to document and learn from these events. The team also expanded its operational services and continued to provide climate advisories to stakeholders and users in Sri Lanka and the Maldives. This includes support for the preparation of the terms of reference to be submitted to the parliament on mitigating floods in Akurana. A book of posters was prepared for the Maldives and distributed to project contributors in the Maldives and USAID officials for Sri Lanka/Maldives. 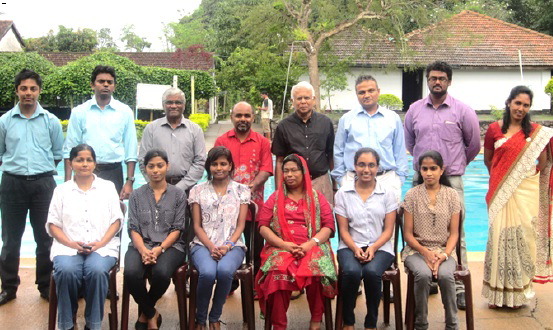 The team also prepared technical reports titled Climate Change Assessments for the Next Century for Sri Lanka, Assessment of Climate of 2015, Extremes Analysis for Sri Lanka Rainfall, and Impacts of El Nino on Sri Lankan Rainfall, and Island by Island Water Resources Budgeting for Maldives. An inventory of available data was also prepared by Junior Scientist Ms. Udara Ratnayake and is available publically. Dr. Zubair also participated in the panel, “Implementing Sustainable Development Goals at Local & Provincial Government Level” which explored engaging and devising a regional sustainability plan which will contribute to the National Sustainable Development Roadmap. This was the first Provincial Sustainable Development Engagement Platform that was held under the theme of “Localizing the Transformation” which assembled over 300 participants including chief ministers and chief secretaries of the nine provincial governments, provincial council members and officials of the Central Province, mayors and local government representatives, CSOs, business leaders, experts, and other stakeholders of the Central Province into a single platform to discuss localizing the transformation. The dialogues focused on engaging provincial and local government in planning and implementing sustainable development goals at local and provincial levels. The team will continue with its planned activities in the coming months as well as follow up on the events in Akurana. They will focus on completing the water resources budgeting tool and will visit the Maldives to collaborate with partners and conduct field work.